Very soon, the imaginary line between the rich and the poor could be separated by an actual door. New York City officials have approved a "back door" proposal that will allow a high-rise condo building to create separate entrances for those living in the affordable-housing section of the building, the New York Post reports. And in case you think you read that wrong, let me state clearly that the idea here is that those who can afford the swankier digs in the unit can use the glitzy front entrance, while those who are in less-expensive accommodations will use the back-alley entrance. The "poor door," as it has come to be known, became the center of controversy last year when developer Extell introduced the idea regarding a 33-story luxury condo on Manhattan's Upper West Side. 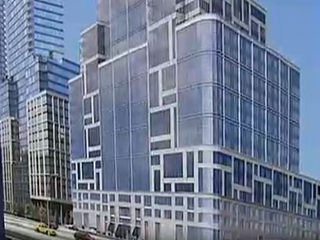 The condo would include affordable-housing tenants, who would have to enter the building through a separate entrance, according to the New York Post. A spokesman for the city's Department of Housing Preservation and Development told the Post that Extell's application for the Inclusionary Housing Program had been approved—complete with the "poor door." According to the paper, developers are allowed to build large properties as long as they include affordable housing. This new development "will have 219 units overlooking the waterfront and 55 affordable units in a 'building segment' facing the street," the Post reports. Gale Brewer, Manhattan's borough president, told the paper that city officials will reject future developments with separate entrances.